Is it This? Or That? | OccasionalPiece--Quilt! Is it This? Or That? 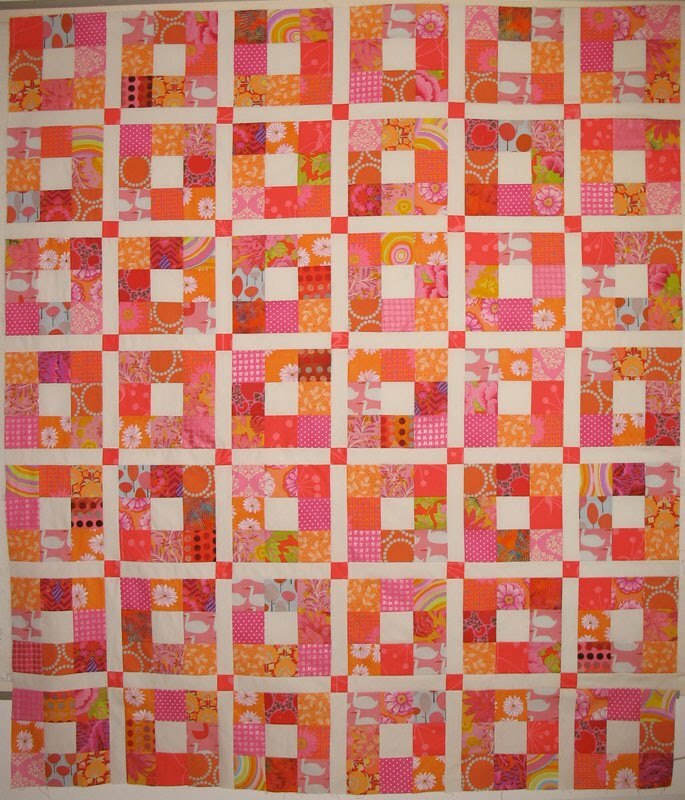 Posted on August 7, 2009 by Elizabeth E.
I finished the quilt top of the red, orange, pink quilt and also stitched all the squares together for the back. I think the quilter lady is out of town, but my part is done and I’ll wait for her to return. This summer I have also stitched together a totebag (had to try the pattern), a jacket, two skirts, a purse, two quilts, finished editing my father’s memoir, watched my youngest son get married, taken three short trips, maintained several blogs, written up my teaching course outlines/documents/syllabus and a couple of the first assignments. I actually made a List of Summer Goals, and was able to check off most of them, including reading the Michael Pollan books, a novel, a “reflection” (that’s what the dust jacket says) and a memoir. I also planted my garden (although its performance is abysmal), had countertops put in, new windows installed, made a trip to L.A. and didn’t get killed on the freeway. And while my hands were busy, I thought about the novel I began in grad school and never fleshed out, never finished. Time to think has been one of the biggest yields of this hiatus. I need two more summers like this one in order to catch up with everything on my To Do List. But my question is, is this summer my real life, or is it that other life, the one where I’m running like a crazy person, avoiding the grading, trying to check off the list of “have-to” chores and always tired (I counted yesterday while doing errands: a total of 100% of people, when greeted by a friend or a salesclerk asking How Are You? answered “Tired.”). Maybe this is why I see lots of cartoons of people shackled to their desks in their cubicles, dreaming of breaking off the cuffs. Maybe that’s why I hear about people quitting their jobs and trying something smaller and new (although my son will attest to the fact that if you are thinking of quitting your daytime job and starting a small business, this is NOT the year to do that). Maybe we all dream of that Other Life, which holds our possibilities, our potentials while we trudge along in the life that pays the bills, feeds the children, wipes up the floor, watches the tomatoes shrivel in the garden, swelters in the heat and dies knowing they missed out on their Big Chance.